Aaron is a Transportation Engineering Manager for the Design Division of the North Dakota Department of Transportation (NDDOT). He works in partnership with the Upper Great Plains Transportation Institute and NDSU. Aaron supervises engineering activities at DOTSC. 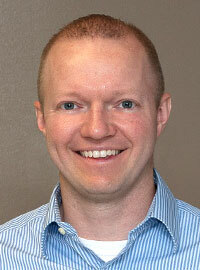 Aaron is the NDDOT's DOTSC section leader and serves as project manager. Aaron provides training and guidance to student design assistants working at the Support Center. He helps students understand the NDDOT project development process and apply engineering principles of highway design to NDDOT projects throughout the state. Experience in construction engineering as a; project engineer, field engineer, and an inspector. Provide essential engineering knowledge to students and demonstrate the application of that knowledge to NDDOT projects. Utilize the DOTSC environment to explore new engineering practices and technologies. To introduce students to public aspects of engineering and to provide opportunities for them to get familiar with public speaking. 2005-2011, Consulting Engineer, SRF Consulting Group, Inc.